Why bother with a shaving brush at all? Shaving brushes are used to stir shaving soap, as opposed to the aerosol canned shaving creams that burst forth with lather. The process of applying the brush with water and foamy lather to your face exfoliates your skin. Shaving with a brush and soap softens your beard, and distributes the lather evenly. It also helps lift your hair away from your skin if you decide that you are ditching the beard and mustache trimmer in favor of a cleaner look. Why do these things matter? Well, compared to using shaving cream with your fingers, which can matte your facial hair, clump it, and is difficult to evenly distribute, having the hair lifted means you don’t have to scrape the safety razor so hard against your skin. It also reduces nicks and cuts that commonly occur when you hand-apply shaving cream. So, for a smooth, even shave, using a shaving brush is your best bet. What’s the Real Deal with Shaving Brushes? Well that makes total sense to us, but there are so many options to choose from out there! We are going to set the facts straight for you and let you in on some nice info before we tell you about some best shaving brushes. You may or may not know this, but there are several different types of bristle options for shaving brushes. Yep, there are bristle fibers made from boar, badger and horse hair. The prices will vary based upon the hair type and even the handle that’s hanging onto the bristles. Boar hair is pretty thick and is pretty common as well as easily found. It is also less expensive than some other options. Badger hair is out there too and it’s kind of like the jack of all trades of shaving brushes. It’s versatile and the silky nature of badger hair makes the quality rather nice too. Each type of bristle has its own softness, durability and longevity to look out for as well. You’ll ultimately want something that fits into your shave routine the best. We will expound upon this more in just about, so don’t go anywhere. Each type of bristle and brush style you use will have a specific way that it should be used. You will first want to soak the brush in some hot water and then do your best to remove any excess water hanging out at the top of the hairs. Get busy whisking away in your shaving mug (or bowl if that floats your boat). This should result in a nice lather that you can then apply to your face. Most guys like to use a sort of flicking and massage method that helps your whiskers stand away from your face and gives your face a gentle exfoliation. Keep in mind the type of bristle you have when selecting your shave soap or shave cream as well. Boar bristle shave brushes are ideal for solid shaving soaps. The rigid nature of the hairs helps to work up a great lather. Badger bristle shaving brushes are better suited for creamer shave soaps or creams. The bristles are generally softer and have pretty excellent heat retention, so your resulting lather usually has a better hold and is thicker. How Do I Care for My Shave Brush? It’s important to rinse your shaving brush really well after each use and wash it. Once you’ve made sure that all off the shave soap is out and it’s clean, go ahead and hang it upside down. Hanging it upside down ensures that all of the extra water that hangs onto the bristles has a place to go and will also allow you to maintain sterility. 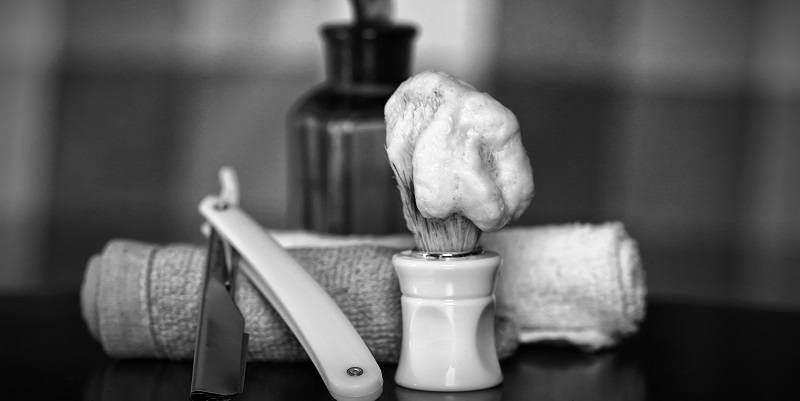 Proper care for your shave brush will ensure that it lasts for a long time and maintains its performance integrity. What kinds of shaving brushes are there? As you will see from our table, the prices can range from $12 to $120, and higher. So, how do you know which one you’ll like? One thing you can do is consider whether you want softness or briskness against your face. Some people with sensitive skin want soft bristles. Others want a brush they can really feel against their skin, opening their pores. Those are only a couple of things to consider. There are about four standard types of shaving brush: badger hair, boar hair, synthetic, and horse hair. Let’s take them one by one. Badger hair shaving brushes are considered by some to be the gold standard in shaving brushes.They hold a lot of water, make a good lather, and release that water and lather easily to your face. The main differences between the really expensive ones and the cheaper ones are the thickness and fullness of the bristles, where it’s made, whether it’s handmade, whether or not it’s silver-tipped (those bristles come from the softest part of the badger– the underbelly), and what kind of handle it has. Some people like the feel of the wood handle, but those can rot over time. Acrylic handles are nice to prevent rot. But the real key with all shaving brushes is that you have to hang them up or they won’t dry. Badger hair does take some time to dry. It may also have a slight gamey odor at first (until it really starts to absorb the smell of your soap). The Premium Black Pure Badger Shaving Brush By Wet Shaving Products seems to be a good deal at a reasonable price ($25-$44). You can get a $12 badger brush, but if you are going to invest in a badger brush rather than synthetic, why go with the cheapest (which won’t have as much fullness and may shed more)? The scent seems to be the main issue with not using these brushes. However, they are popular (the Omega brush in particular seems to be well-liked). Boar brushes are coarser than badger brushes. This can mean less softness against the skin, but also a firmer shape than the badger brushes. Some people claim this creates a better lather. The bristles are scratchier against the skin than badger brushes, so again, it comes down to personal preference. Boar brushes also need to be soaked in hot water for about ten minutes before use, so you will need to plan accordingly. The bristles do soften over time. Boar brushes have a tendency to shed their hair more than badger hair, but the shedding is generally minimal. These brushes last a long time. Among the boar brushes, the price and durability of the Omega Pro 48 brush ($11-$18) make it hard to beat. For animal lovers, or anyone who does not like the idea of putting animal hair against their face daily (and those particularly sensitive to a gamey odor), there are a lot of good synthetic brushes out there to choose from. In addition to having the softness of badger bristles, synthetic brushes are less floppy than badger brushes. However, they are less scratchy than boar or horse hair brushes. They produce a good lather, and although they may not release water as easily as the badger brushes, they will still give you a good shave. One of the best things about the synthetic brush is that it dries much faster than the animal hair brushes. The Parker Safety brush has a very nice price (about $25), free stand, and boasts a full brush with soft bristle tips. However, the Frank brush has the same price (at the moment), also comes with a stand, and has earned a five-star rating on Amazon. Horse hair brushes are not for the faint of heart. These brushes are going to have a stronger odor than any of the other brushes, and it can last for a few days. Once you get past the smell, you’ll find that horse hair brushes are softer than boar hair, but stiffer than badger hair, so you get the best of both worlds. You will also find that the horse hair brushes do not need to be soaked as long as the boar brushes before you use them. There aren’t a ton of horse hair brushes to choose from, but the Vie-Long 13061 Horse Hair Shaving Brush is well-reviewed. The horse hair brushes are also affordable, with most of them running about $30. You might also consider a more costly horse/badger shaving brush, if you are curious about horse hair, but more interested in the badger hair brush.